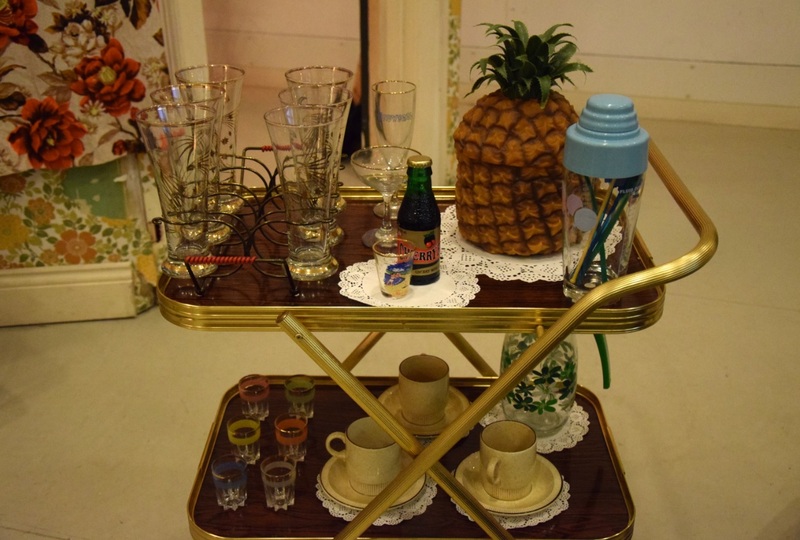 BA Set Design for Screen 2015 graduates, Freya Newmarch and Frankie Markot, recently designed a 1960s West Indian living room set for the Tate Britain event ‘Late at Tate Britain: Stand Firm’ in consultation with Michael McMillan, the author of ‘The Front Room: Migrant Aesthetics in the Home’. We spoke to Frankie and Freya about how they got involved with the Tate Britain on this project, the inspiration behind the living room set and what they enjoyed most about studying Set Design for Screen at Wimbledon College of Arts. How did your work come to be shown at the Late at Tate event on 7 April? Freya: While I was in my second year at Wimbledon, I did a work placement at the BFI where I designed and built a 1960s Afro-Caribbean living room. This was then placed in situ in the BFI’s atrium for the London on Screen season. Afterwards, the set was dismantled and kept in storage at Wimbledon for students to reuse on future projects. A couple of months ago my old tutor got in touch with me and explained that the Tate Collective wanted to install a West Indian living room set for their next Late at Tate event ‘Stand Firm’. The Tate had been in contact with the BFI about using some of their footage to display at the event and the BFI mentioned that a similar set had been built a couple of years ago by Wimbledon Set Design for Screen students. Frankie came on board and we collaborated together to create the version of the set that was seen at the Late at Tate event. Frankie: Sadly a lot of Freya’s original set was missing so it had to be reconstructed! I was asked by Kerry Bradley from the BA Set Design for Screen to redesign it with Freya and was in contact with the Tate from that point onwards. 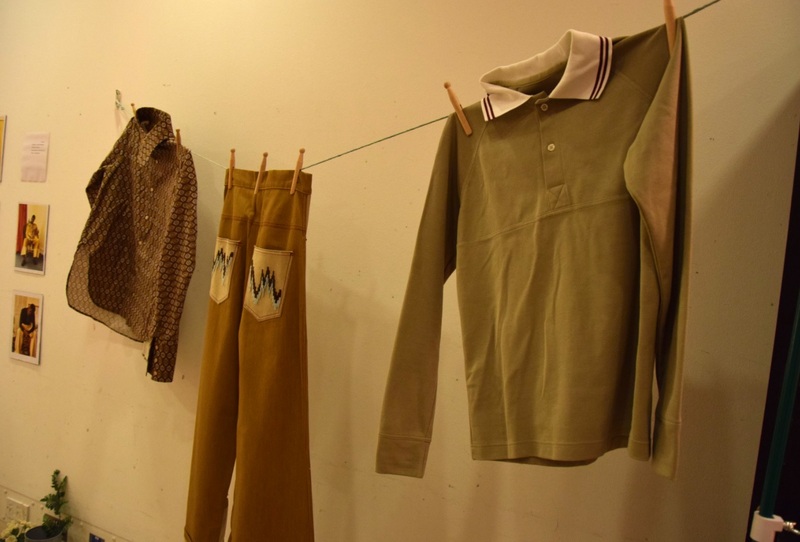 I was also able to add elements to it, like my friend Caitlin Batchelor’s menswear collection that was also influenced by the migrant’s aesthetic. I worked closely with Freya throughout the whole process. How was the event itself and what does it mean for you as young designers to be involved in a largescale event like this? Freya: The event seemed to be a huge success! 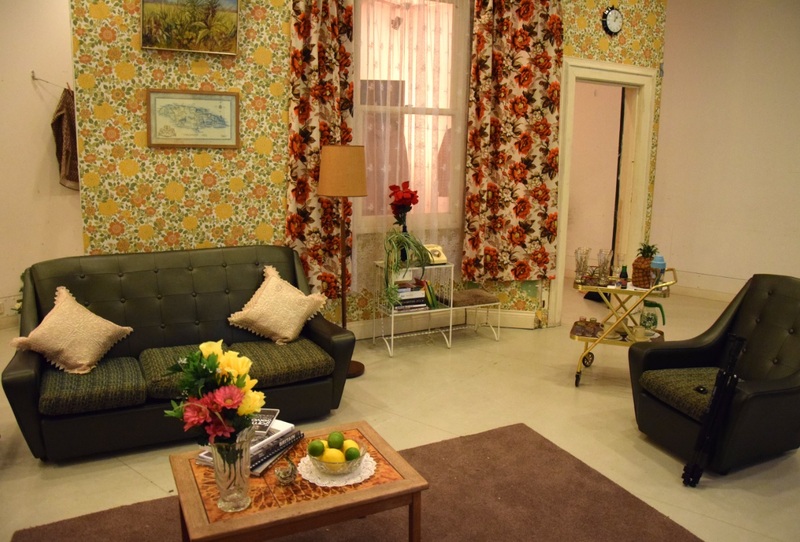 The living room set was in a separate space designated as The Reading Room, where there were books dotted around the set for people to read, projections of TV shows like Desmond’s and a DJ. The event had a great atmosphere and it was amazing to see the public interacting with our set! It was definitely an amazing experience to have our work shown at an event like that, especially as we’re both only just starting out and quite new to the industry. Frankie: It was a lot of fun and apparently around 4,000 people turned up! By 8pm everyone was in there dancing to the records and interacting with the set. The physicality of it had more of a reaction than a set for screen that can get lost among the other contributing factors in the film. The interactive aspect of it was really amazing to see as a designer! When did you first create the set, what was it for and what was the inspiration behind it? Freya: The set was first created in 2015 for a work placement I did for the BFI. 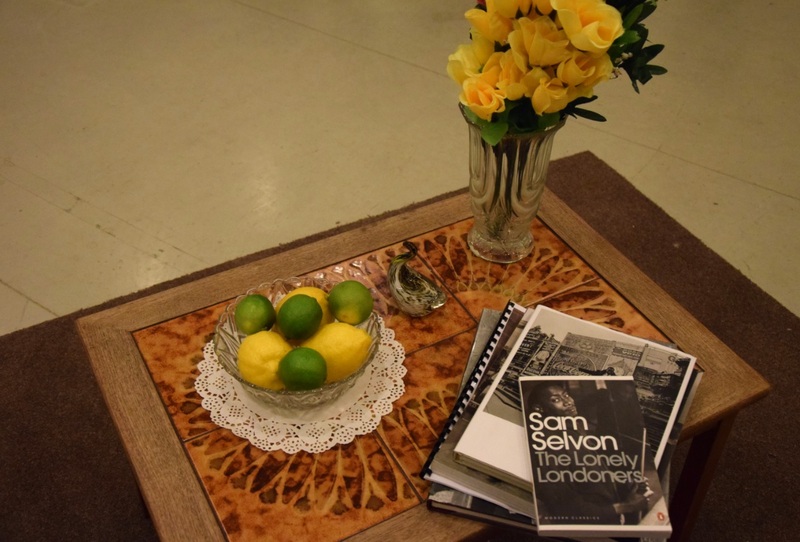 Myself and a group of other students had to design a living space that represented London’s diversity. I designed a 1960s Afro-Caribbean living room after seeing the exhibition ‘Staying Power’ at the V&A, which was a photography exhibition of Black British experiences from the 1950s-1990s. This was the design which was then eventually built and filmed in at the BFI. What have you been up to since graduating from Wimbledon last year? Freya: Since graduating I have been working freelance as an Art Department Assistant. My first job was on a Hyundai commercial, and since then I have worked on other commercials, a music video and the feature film ‘Guernsey’. I’m currently working at Wimbledon Film and TV Studios on an Iranian version of ‘Spitting Image’. What I love most about working freelance in the art department is the variety of jobs I’ve been able to do over the past year, although being freelance definitely also has its challenges! Frankie: I started working at Ridley Scott Associates pretty much straight after graduating. Since then I have been doing a mix of work for them and freelance work, mainly on commercials, music videos and short films, as well as a load of personal and collaborative projects. What did you enjoy the most about studying at Wimbledon? Freya: One of the best things about being at Wimbledon was the opportunity to collaborate, and not just with other Set Design for Screen students, but students across University of the Arts London (UAL) and other universities. It gave me an opportunity to make contacts, build my portfolio with real sets and not just hypothetical designs and also prepared me for working in the industry where you are constantly having to collaborate with others. Frankie: I enjoyed the familiar environment. It was a very comfortable three years with lots of encouraging people around. I also feel like in other university environments, set design could very easily be approached as just a film practice, but being at Wimbledon allowed you to explore a more fine art side to your work also. What advice do you have for students who are hoping to forge a career in set design? Freya: The main piece of advice I would give is to get as much work experience as possible in the industry so you already have a foot in the door and some contacts before you leave. Also don’t be afraid to contact people out of the blue! I spent the first few months after I graduated contacting every Art Director, Designer and Set Decorator I could, sending them my work and CV and asking if they needed an assistant. That’s how I ended up getting my first job! Frankie: Start lifting weights because you are probably going to be carrying many heavy things! And buy a drill! Be as friendly as possible because everyone loves a good chat, and you’ll be more likely to get regular work if you have a positive attitude. Be prepared to feel displaced when you leave the comfort of university life, but know that it does get better! Do you have any upcoming projects you’d like us to know about? Freya: I’m going to be pretty busy with my current job until August, but Frankie and I are planning to set up our own set design studio which will give us the chance to work together again in the future. I’m also in the process of starting up a festival fashion business where I’ll be selling my creations on Etsy. I’m currently making a jacket covered in pom-poms which will hopefully be ready for Glastonbury! Frankie: I was recently Art Director on a great music video for Black Dog Films, so I’m very excited for that to come out! I am also doing a bit of camera work at the moment which is a new thing for me. BA Set Design for Screen and BA Technical Arts & Special Effects have combined under a new course called BA Production Arts for Screen. Learn more about studying BA Production Arts for Screen on our website. We hope you can join us at our Undergraduate and MFA Summer Show this year! Click here to find out more.